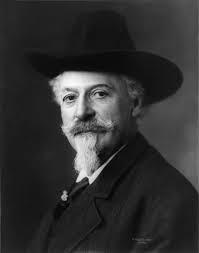 Buffalo Bill Cody, Entertainer, North Platte, NE. William Frederick “Buffalo Bill” Cody was born on February 26, 1846, in Le Claire, Iowa.Â A soldier and hunter, Cody was awarded the U.S. Medal of Honor in 1872, for service as an army scout. Â He became famous for the cowboy-themed shows he organized with headline performers such as Annie Oakley and her husband Frank Butler, along with sharp shooters Gabriel Dumont and Lillian Smith, and story-teller Calamity Jane. The show influenced many 20th-century portrayals of the â€œWild West” in cinema and literature and toured in Europe as well as the United States. Cody founded â€œBuffalo Billâ€™s Wild Westâ€ in 1883, in the area of North Platte, Nebraska.Â He was also active in the concordant bodies of Freemasonry, and was initiated in Platte Valley Lodge No. 32, North Platte, Nebraska, on March 5, 1870. He received his 2nd and 3rd degrees on April 2, 1870, and January 10, 1871, respectively. He became a Knight Templar in 1889 and received his 32nd degree in Scottish Rite of Freemasonry in 1894. In 1886, Cody purchased a 4,000-acre ranch, which is now the site of the Buffalo Bill Ranch State Historical Park, also known as Scout’s Rest Ranch, and can be found along U.S. Route 30 two miles west of North Platte.Â The property includes a Second Empireâ€“style mansion built in 1886, as well as many other historical exhibits.Â It was added to the National Register of Historic Places in 1978. Cody died of kidneyÂ failure on January 10, 1917, at the age of 70.Â In 2010, the Buffalo Bill Historical Center and the University of Nebraska-Lincoln Department of History collaborated on Buffalo Bill’s Wild West and the Progressive Image of American Indians.Â The project is based on Codyâ€™s ideas of progress, change, and transformation, the project highlights the social and cultural forces that shaped how American Indians were defined, debated, contested, and controlled during his era.